It was very quickly brought to my attention that there was an error on Row 12 of the Snow Buddy cloth and Row 16 of the Snow Buddy bib. 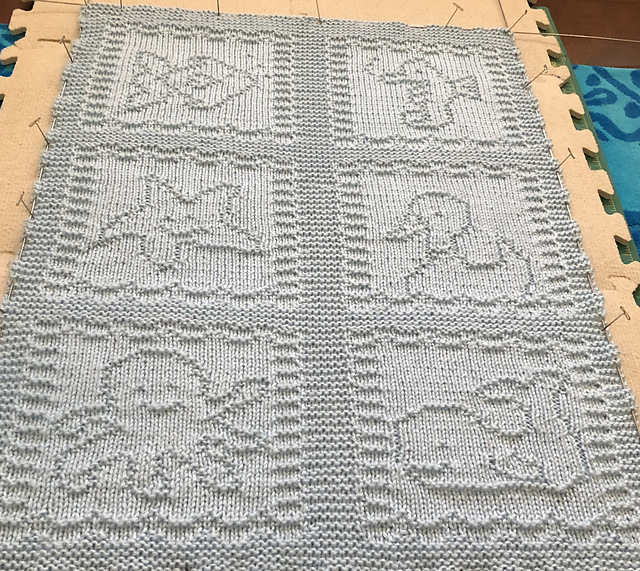 I was about to send my testers to bed without any supper, however, I realized that we all had discovered that error before I posted the pattern. For some reason, when I uploaded it to the program I use, it took the "test" version and not the corrected one. This has happened to me before and I confess that I have no idea how it happened. I have it corrected now, so you can download it again. 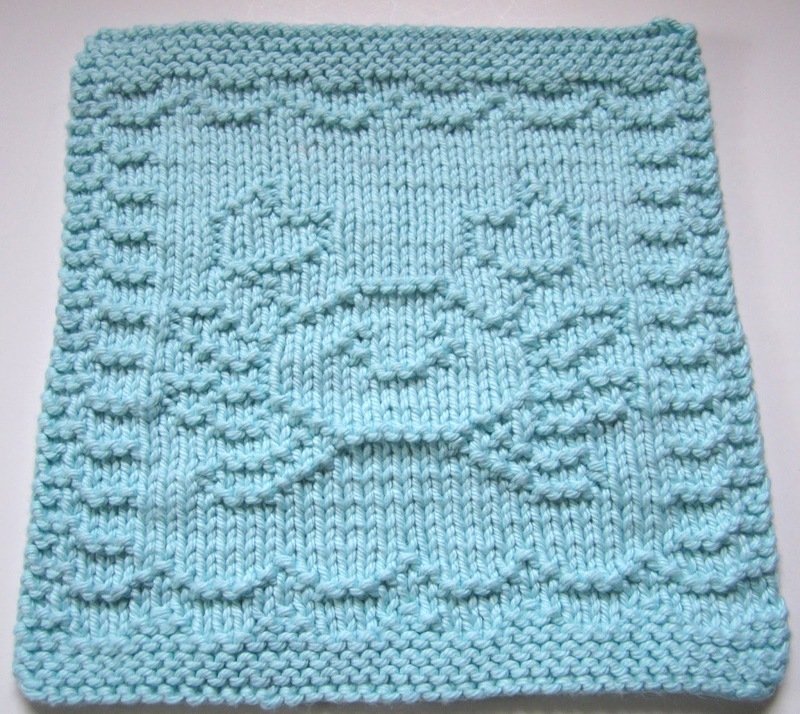 This is a perfect example of why I should just stick to knitting and not try to do technical stuff, like a blog! I apologize profusely. Hopefully, I won't have any more posts like this one, however, I confess to being human. Remember if you're having a problem with the written instructions, you can always double check a row against the chart. Wow, I can't believe that it's time for my annual birthday post! It's been quite a year dealing with my father's declining health and his subsequent death a few months ago. He passed away just a week after his 92nd birthday. He always told everyone that he was "strong as an ox", despite his multiple medical issues. Every time we thought he might not make it through a medical crisis, he'd pull through and surprise us all. I think he finally reached the point where he just wanted eternal rest. He led a very full life that was filled with good deeds for so many people, especially children. He would take old bikes and fix them up and give them to kids who couldn't afford one. He'd stand out in the blazing sun and in the freezing cold, day after day, selling candy to raise money for many organizations. He was most proud of his work with finding funding for under privileged children who needed dental work. He helped countless children to get the dental work that they desperately needed. For all his work, he was recognized nationally as a "Doctor of Smiles". Always a proud member of the Masons, he was thrilled to be asked to become the first Caucasian male ever to be inducted into the Black Lodge of Massachusetts. It was an honor that he cherished. We were, and still are, so proud of him and miss him terribly. He left a pretty big hole in our family. On a happier note, I hope you'll like my snowman. The idea just popped into my head one day and I thought it would be good to have him make his debut on my birthday! 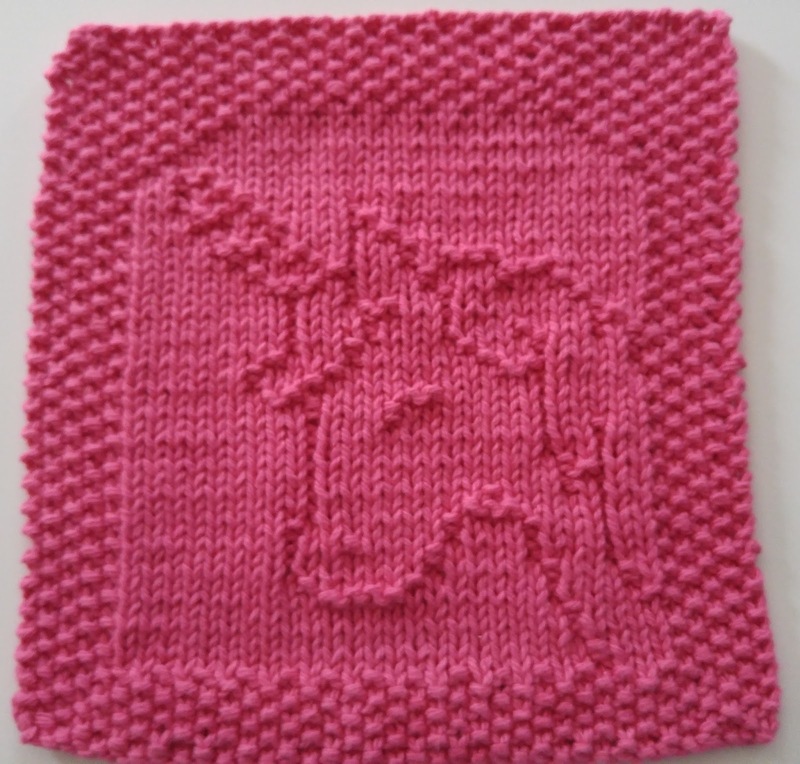 Many thanks go to my talented test knitters, Denise and Tunie! It's such a luxury for me to have both of them willing to help me out! Even though I try hard to catch any errors, I'm only human so I'm grateful for the extra "eyes". 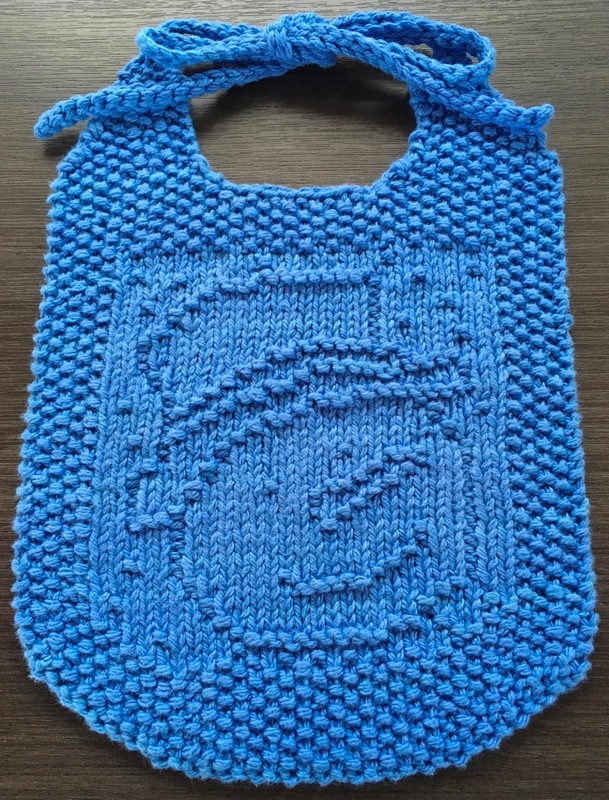 Denise knit the blue bib pictured above. I knit it in red, but it's so hard to photograph that color. I should have known better and used a different one for the picture. See what I mean? It shows up so much better in the blue. I love snowmen and this one is fairly quick to knit. 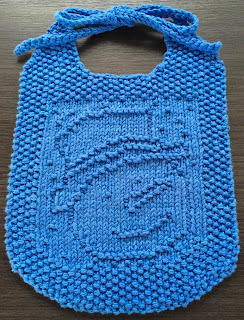 The links are in the sidebar to the right, or you can click here for the bib and here for the cloth. It sure would be great if this is the only snow we'll see all winter, but I hear that it's supposed to be brutal here in New England. I hope they're all wrong!! I thought you'd all enjoy taking a look at this adorable blanket that a fellow knitter made! Isn't it pretty? Cindy gave me permission to share it with all of you. Check out the square with the barn. That's her own design and how appropriate. I love it! 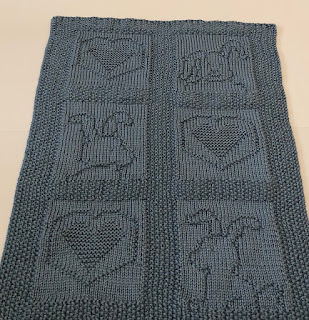 Here's a link to the blanket, with all its details, that she posted on Ravelry. 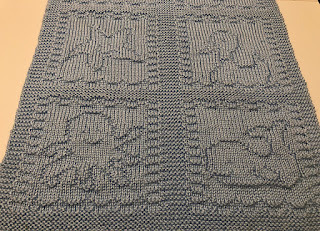 Baby Farm Blanket She used three skeins of Caron's Simply Soft Solids in a pretty green. (My favorite!!) I've never worked with that yarn before, but I love the way the designs look knitted up in it. Well done Cindy and thank you for allowing me to share! 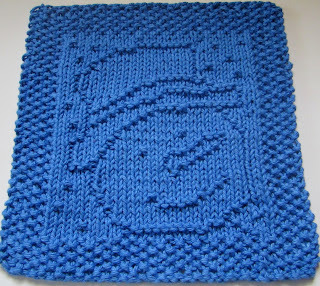 I knit it up using Hobby Lobby's I Love This Cotton! in aqua. I really enjoyed working with this yarn. It's so soft, although I did have to drop down a couple of needle sizes to get the design to pop. 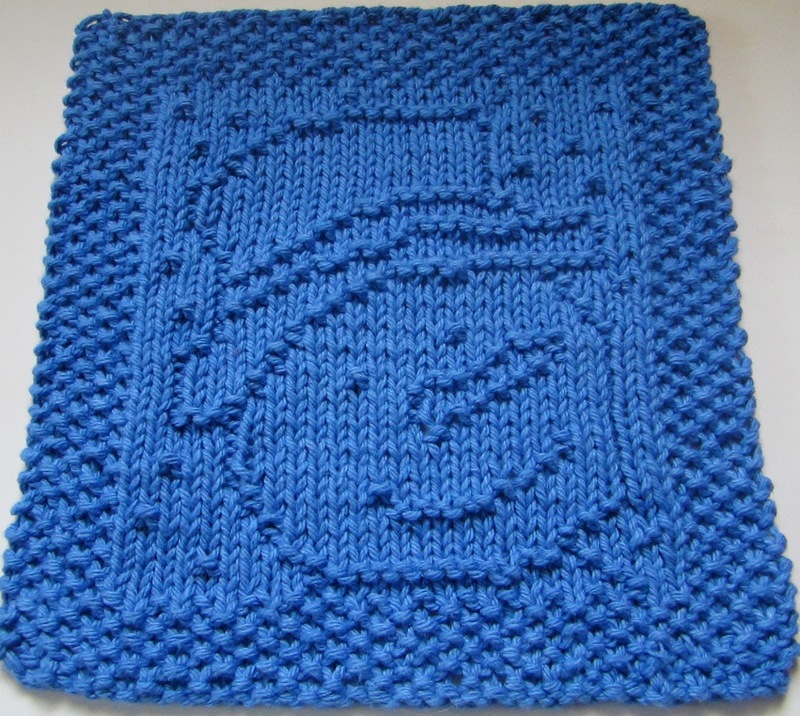 It would make a great facecloth or a blanket square. 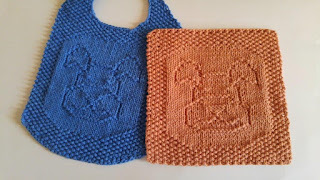 The bib is knitted up in my old standby Peaches & Cream. 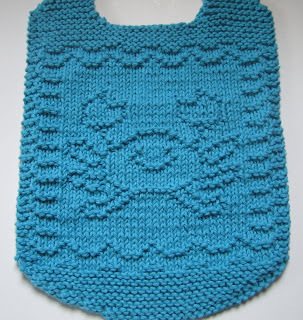 It's a good choice for bibs and holds up to repeated washing. At least that's what I've been told. 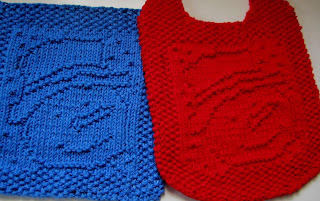 Unfortunately for me, all of my grandkids are well past the age for bibs! The cloth uses the same stitch width and row height as my other "water" cloths. I wanted them to be the same size in case anyone wanted to use them together. I might have missed one or two, but I think this covers it! The pdf patterns are in the sidebar to the right. The bib is also here and the cloth is here. 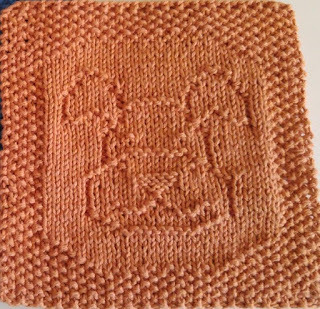 As always, if you find any errors, I'd appreciate it if you'd let me know, although I have knit this crab several times! I did a second version as well with skinny legs, but decided I like the original better! I hope you do too! 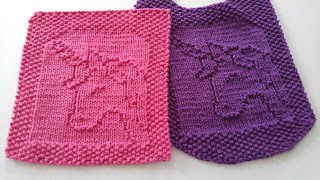 Now here's a couple of really sweet blankets that I'd like to share with you, especially since it's Valentine's Day! A fellow knitter on Ravelry, Ellen, shared these with me and I thought you'd all enjoy seeing them too! She knit them for charity and they're destined for a NICU. 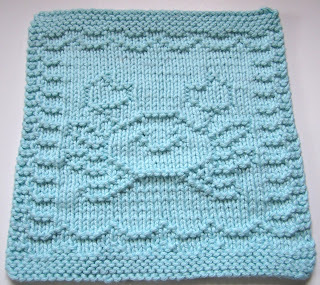 First, she used my bunny patterns (A Tail of Two Bunnies and Hippity Hop) and combined them with my Heartbeat pattern. 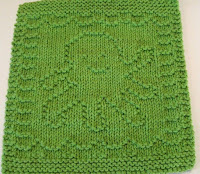 She used Caron's Simply Soft Solids and used U.S. size 5 or 3.75mm needles. 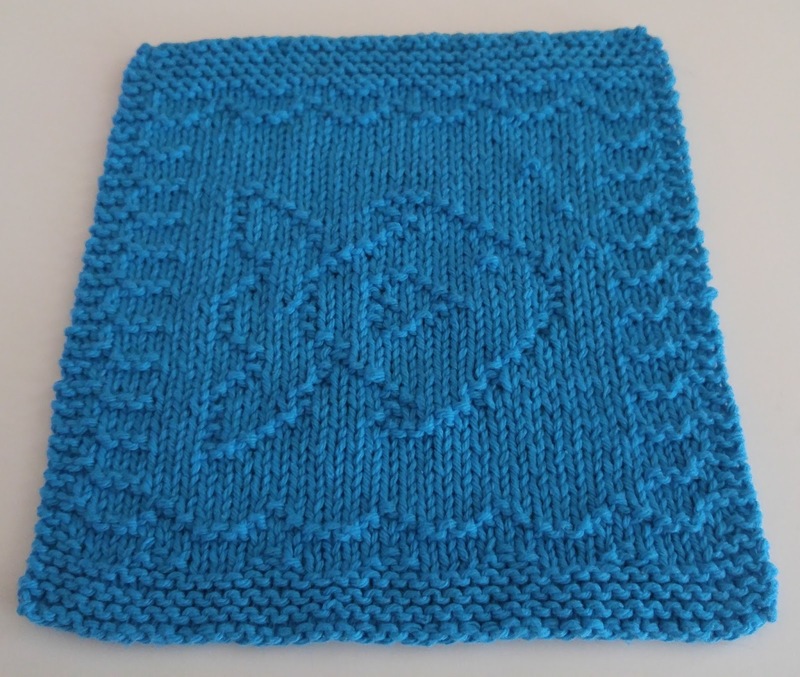 Her second blanket used my "water" themed squares and she aptly named it "Water Babies". I have to confess that I just love this one! 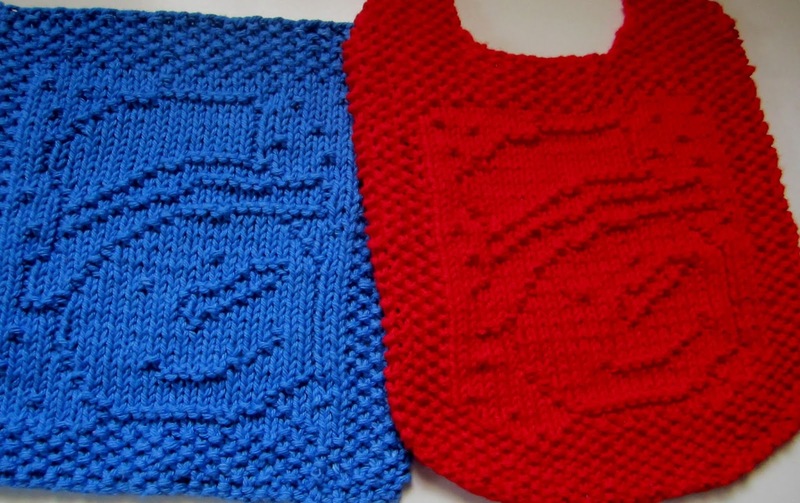 The blankets are naturally small, since they're intended for preemies. 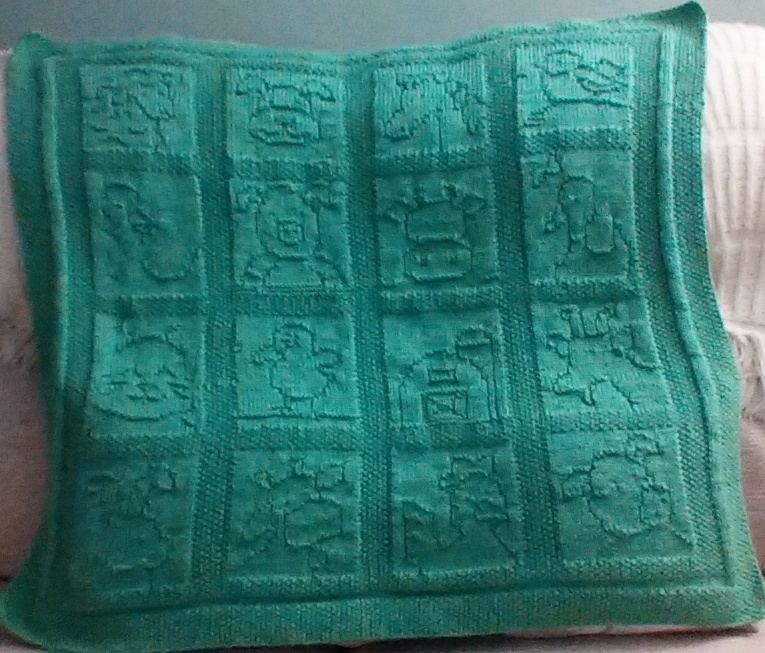 Each blanket measures about 17" X 23". 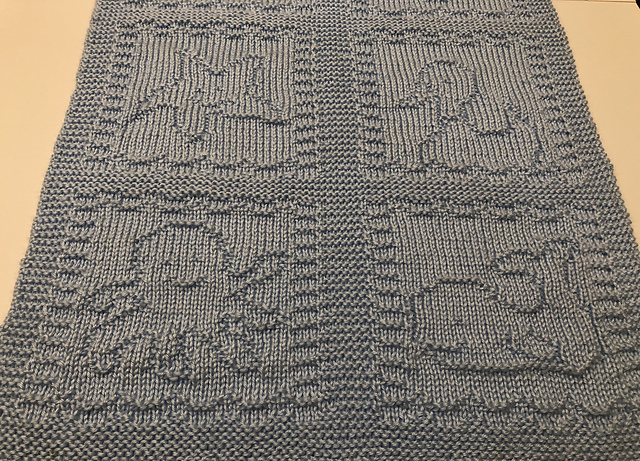 Both blankets look a bit gray, but they're light blue and country blue. Aren't they darling? I'm so flattered that Ellen wanted to use my designs. 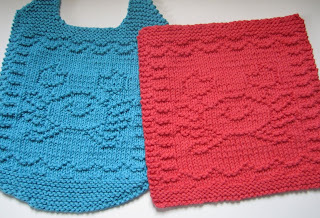 If you're on Ravelry, be sure to tell her how much you like them too. Ellen uses "melk" as her Ravelry name and I know she'd love to hear from you! Thank you Ellen for giving me permission to share your beautiful work! I had intended to actually post this on New Year's, but life got in the way and so I'm only a couple of days late. I hope this isn't a sign of how this year is going to go! You'll have to trust me when I tell you that this pattern looks nicer in person than the photographs suggest. For some reason, my new camera doesn't like taking close up photos. I can't tell you how many pictures I snapped trying to get a true likeness. I was at the point that I debated whether or not to even post it! 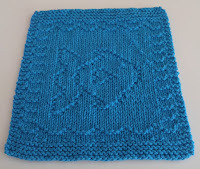 What I should have done, is begged my good friend, Denise, to do a test knit and then use her photos! 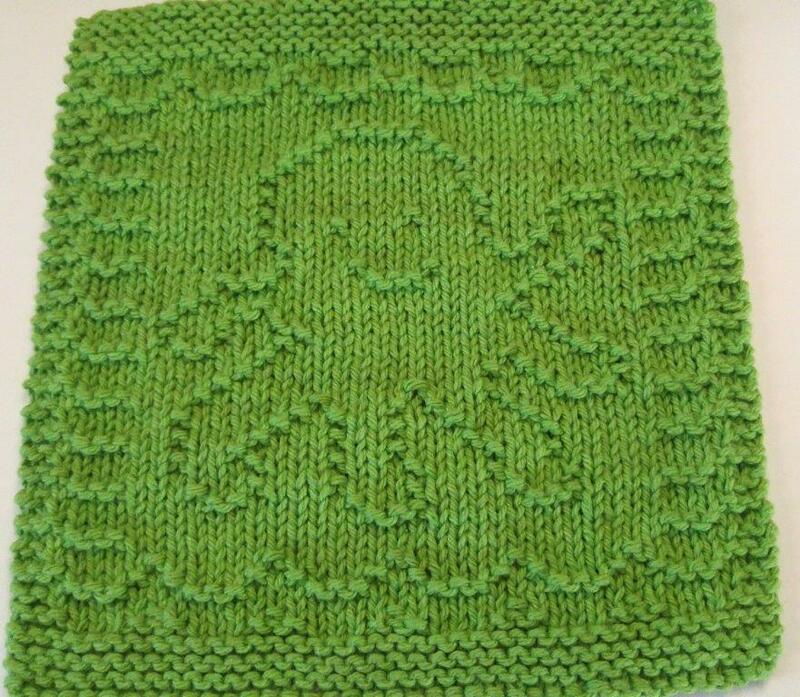 She's an amazing knitter and always gets great pictures of her projects! In any event, here's my latest design. A happy little mutt! This cloth has the same number of stitches and height as the majority of my cloths. I try to keep them pretty consistent so they could be used together for blankets or whatever. You can see what I mean about not getting a good picture. So frustrating! 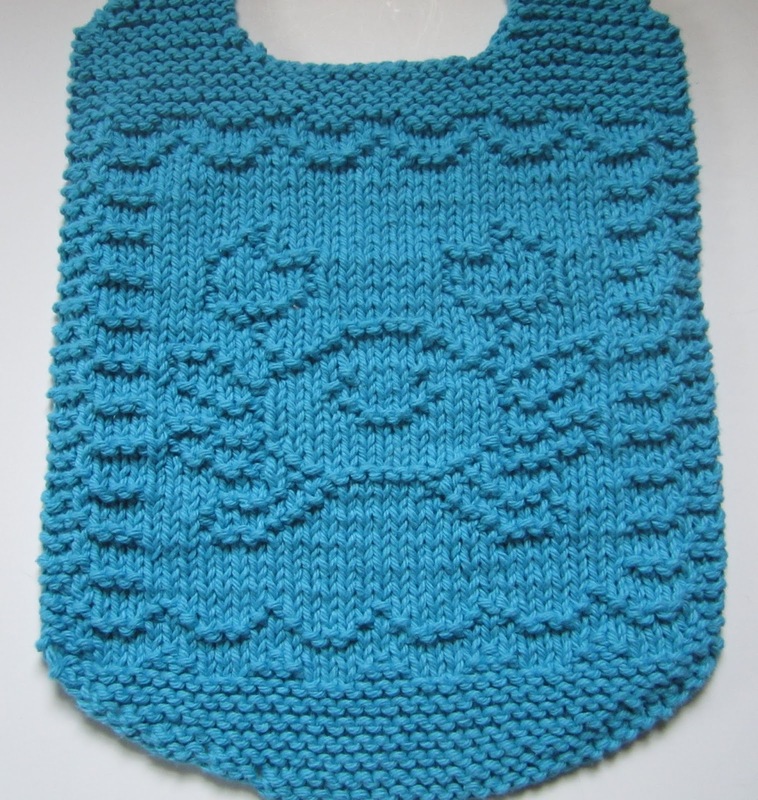 The pdf for the bib and the cloth are in the sidebar, as usual, or you can click here for the bib and here for the cloth. If you knit this fella, I hope that you'll post a picture on Ravelry. 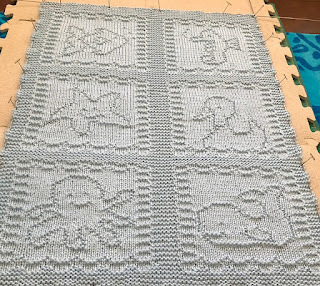 I love seeing all of your projects! Happy New Year!! Well, if it's October, it must be time for my annual birthday pattern! I know I haven't posted in quite awhile, so if anyone is still reading this blog, I apologize for the long absence. I've been super busy working on knitting hats for the babies at my local hospital. I also "volunteered" to knit mittens for a Christmas fund raising event for our Historical Society. Actually, my husband asked me if I'd do "something" to help out, so I chose mittens. I'll post some pictures of them in another post, if you'd like to see some. I love knitting mittens. Well, I did, but after 26 pair, I'm a little burned out. In any event, back to my birthday post. 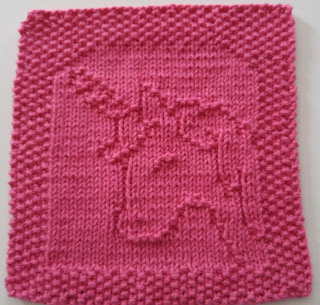 I was struggling with what to make, when a Ravelry friend asked me if I had a unicorn. I don't do special requests, as it would be impossible to please everyone. As I've said many times before, I just do these for fun and I'm happy to share. I never intended this to be a job and I'm not an artist by any stretch of the imagination! The idea of a unicorn appealed to me though and I gave it a whirl. I think my granddaughter would like this one. She's way too old for bibs, but she likes to take the washcloths and use them as blankets for her stuffed animals! 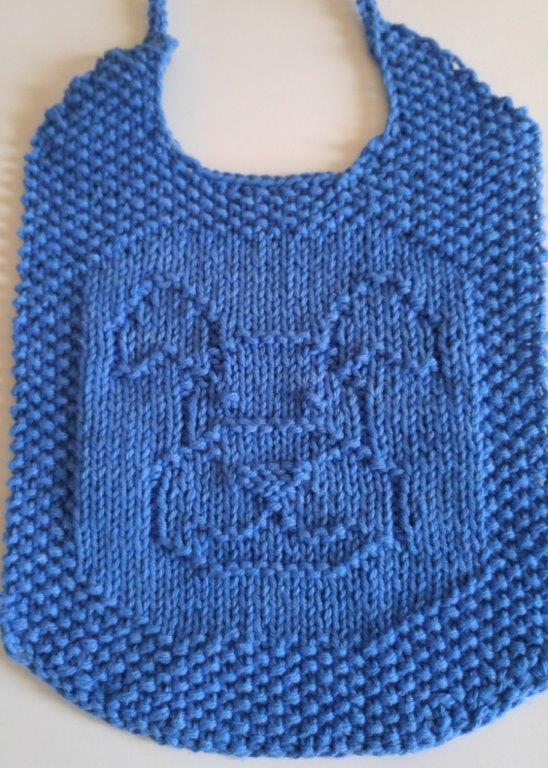 I'd post a picture of the bib, but for some reason, every time I try, it comes up sideways! 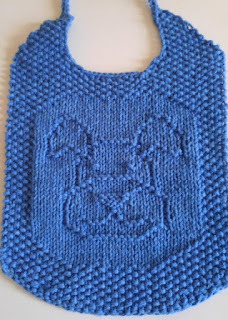 The links to the patterns are in the sidebar, or you can click here for the bib, or here for the cloth. Note that they are listed as "Baby Unicorn" in the "updated" files. 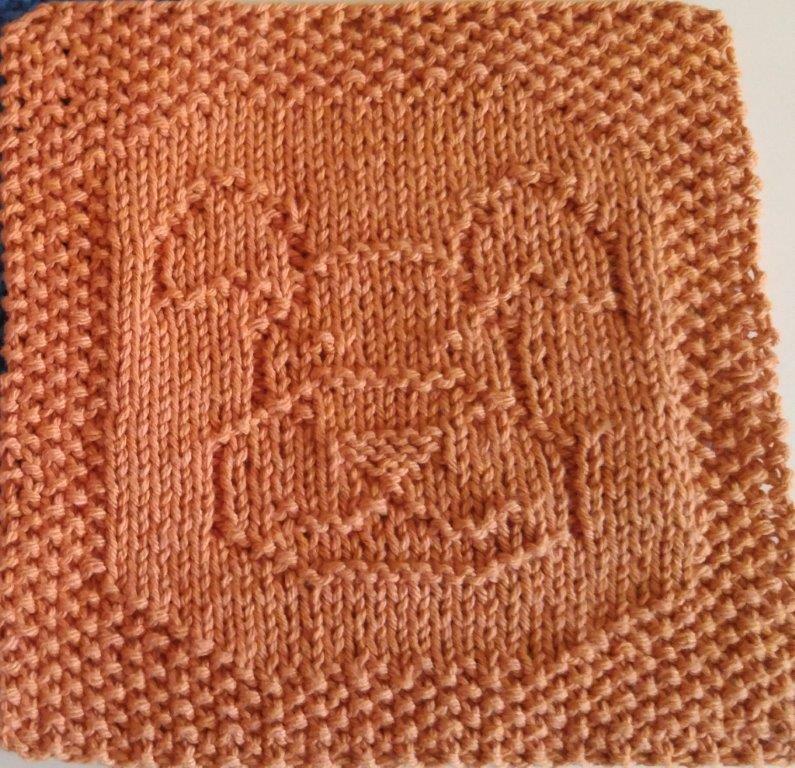 Many thanks to LouLou for test knitting the pattern. Such a luxury for me! I hope you all enjoy my birthday present to you.